What a day! I finished in around 1 hour, 41 minutes, give or take. I got a little teary at the finish line, which I was not expecting, I was definitely challenged but I had fun facing up to it and felt very grateful for my health and my body. And now, for more details than are necessary. I got up at 5:30am, a little later than I wanted (I didn't hear the alarm) but still with plenty of time to get there. I only had a few things to do before I left - get some coffee, eat breakfast, get dressed, grab my phone, grab my bag, put my bike on the car - I remembered most of them. On my way to the event I realized I forgot to eat breakfast. Doh! So I stopped at a gas station and purchased a Special K protein meal bar. Ok, back on the road. I parked a little less than 2 miles from the park and got all my gear ready. I knew it would be dark at that hour (it was still totally dark last week at 6:30am when I left boot camp) so I'd put a light on my bike. That was smart because it was totally dark. A guy followed me the whole way and thanked me for having a light. More on him in a second. So I was riding while wearing my gear bag messenger style and it slipped to the side a few times. It was heavy and moving it back around to my back made me wobble on the bike. I decided I am going to ask for a tri backpack for Christmas. But I made it to the park and all was good. I got in line for number marking and the volunteers asked if we want to number one another to keep things moving faster. Sure! I numbered the guy that followed me in, and he numbered me. He asked if was a pro being that I had such a low number, 11, and I laughed. I appreciated the humor at 6:30am on a cold morning. After that I headed into transition to choose a bike spot. It wasn't crowded yet at all so I got a spot right near the swim exit. I considered setting up near where we take our bikes out but decided I'd rather have a shorter walk in my wetsuit and a longer one with my bike. A few minutes after I started setting up the person who'd set up in the spot next to me returned and said, "Oh good, I'm glad you're here." Or something like that. 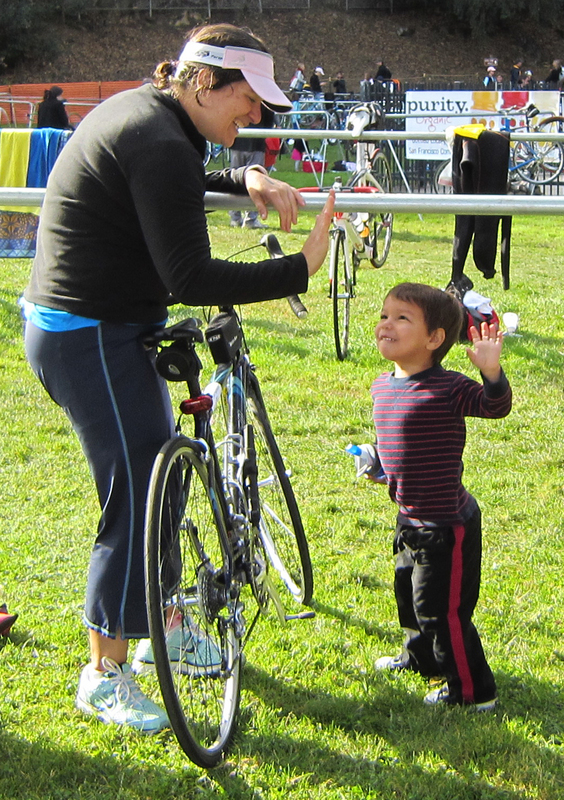 She went on to say it was her first triathlon and she was very nervous. Her name is Naomi and she was supposed to do this with a very experienced friend (a person who's actually won some of these things) but her friend had last-minute gall bladder surgery so Naomi was going it alone. 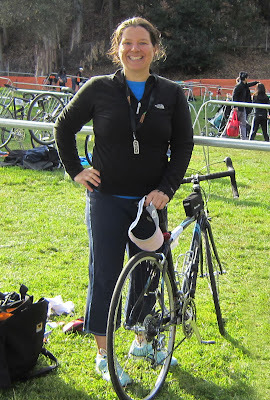 She's done other events, just not a triathlon, so was nervous about the swim part. I helped all I could, being a sort-of newbie still myself, and did my best to help her stay calm. That's Naomi, on the right, and that's Marisa, in the middle. She's one of the staff at TriMore Fitness (the group I did the practice swims with and the "official training partner" of the event). As you can see from this picture, it's starting to get light out. This was taken at 7:38 so we're 22 minutes from start, about an hour from our wave. The guy on the other side of me realized he forgot his goggles and asked if we had an extra set. I did! He was grateful and I felt good about being neurotic. All my gear is set up, I tried to take a picture of my set-up but mostly just got my bike. Nerves, I guess. So off we go to watch the first people take off. It was very exciting, hearing the horn blow, seeing the swimmers take off and come in. And then it was time for my wave, the female "40 and over" wave. There were only two female age groups, under 40, or over. Our wave had pink swim caps. The younger ladies had blue swim caps. I was happy with the pink. The men had a third age group in the middle, 35-44. Aaaanyway...it was our time to get in the water so I did. The water was cold for sure but with the adrenaline I felt like it didn't quite register. I was too focused on the whole event to put much attention on the water temperature I guess. So before you know it the horn went off for us, and off we went. Instead of the small white bouy's I sighted with during practice swims we had huge orange markers. Made sighting SO much easier and I think I stayed pretty well on course most of the time. There were a few times that I swam into others but for the most part things were pretty smooth. I felt good while swimming, a few moments of feeling like my arms were getting tired but other than that I cruised along for 500 meters. I glanced at my heart rate monitor when I got out and I *think* it said 14 minutes but I can't be sure. The other thing that was on my mind were my toes! They'd been so cold they were basically numb. I could feel that burning cold pain in my feet and was wondering how long it takes for frostbite to set in. I started picturing myself in the medical tent due to "cold toes" and started imagining them all black with frostbite, and then wondering what my life would be like with no toes. That's how cold they were. Man I wish I'd had warmer socks on. In any case, I made it back to transition and generally still felt pretty good. I changed into my running clothes and had a quick internal debate about putting on my windbreaker. I passed on that but I put on the crop workout pants to keep my legs warm and, most importantly, look cuter. I headed out for the run and knew I was moving like molasses but didn't much care. The road up and out of the park is darned steep so I had to walk some of that but otherwise I got to running and thought, "I feel pretty good, I think I might be able to run the whole thing." In my training so far I've never run farther than 2.25 miles so that would be an unexpected treat. I was wiggling my toes and they warmed up eventually. I took a "bite" out of a HammerGel and had a couple sips of water at the water stations. At one point I started to get a cramp in my stomach and got worried I might have a cramping issue (and have to walk) but, thankfully, it went away. As I passed the two mile marker my confidence got even higher. I got back near the park and there is another uphill, though not as steep as the other, it is longer, and I ended up walking a small part of that but started running again as soon as I was over it. I still felt pretty good and I was happy to know I would finish. When I got near the finish I had an unexpected wave of emotion. I crossed the finish line with tears in my eyes and if my kids had been there I probably would have broke down. They weren't (took Miguel way longer than he thought it would to try and get there), which was ok. I got my cool finisher's medal and saw the TriMore tent. Coach Neil gave me a big hug and I was so busy being emotional I couldn't talk for a second. Naomi was there too and while the swim wasn't her favorite part she said the rest of the race was great. That's it! 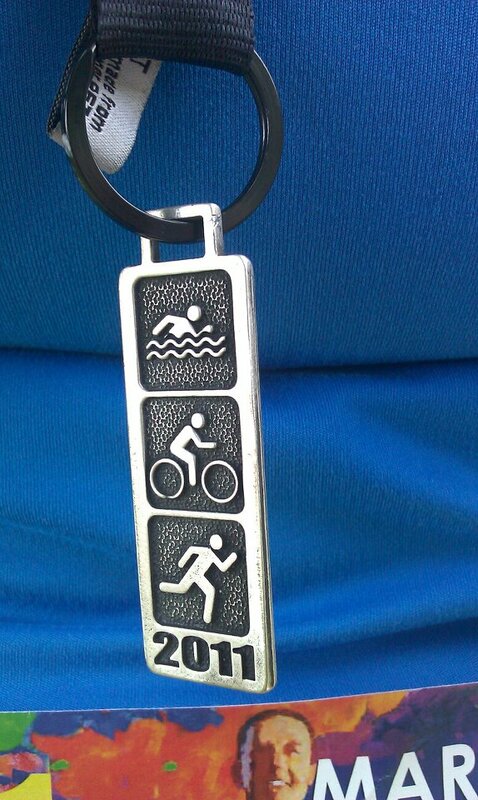 Another triathlon in the bag. 1 hour, 41 minutes (official times to come later), 1097 calories burned and a whole bunch of smiling (I couldn't stop smiling on the run). All my other triathlons were "Tri for Fun" triathlons so even though this was my 4th sprint it felt more novel than that. 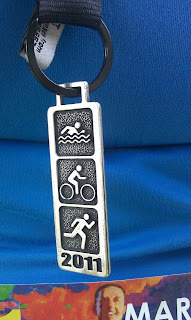 And it got me totally excited about doing the olympic distance next year! (Except the 22 mile bike part, but I think I can fix that with some training and a bike mechanic). The entry fees are half off if you register this month so I'm going for it. 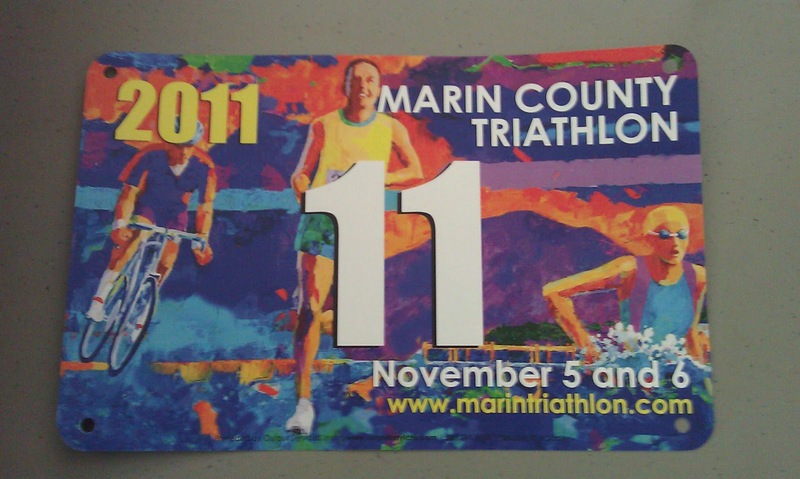 I've been chasing that olympic distance Marin triathlon since getting pregnant with Marek and I think 2012 will be my year! The one of me alone was thrown in to show how 17.8 pounds lost looks on me. I'm starting to look like my old new self, if that makes sense. I didn't mention that I lost .8 pounds last week. Given all the food (and a few cocktails) that's really good! Speaking of food, afterward we headed out to breakfast and I had an omelet and helped Myra eat a pancake that was, sadly, way too big for her. Yummmy. Nothing like post-race food. So to commemorate my post-baby return to triathlon Kristy made me a weight loss chart. I like how there's all the little ups and downs but still with a general downward trend. So realistic. But duh, I guess that's because it is real. I'm feeling very good about my weight, I'm so close to my first mini goal, 178 pounds, and I'm down in clothes size (mostly wearing 12's now, though some are a bit snug still). Also, more high fives on your fitness progress! You look wonderful. Congratulations Michelle! You are so inspiring. I'm so glad that you are back blogging. Your blog was one of the first I ever read. Your story really motivated me to get back on track with my weight loss and fitness goals. I'm now training for my first marathon! The photos are great. Your smile says it all. Great job!! Congratulations!!! Thank you for sharing. You are an inspiration!! i LOVE "I put on the crop workout pants to keep my legs warm and, most importantly, look cuter"
That is SO MUCH how I would be! Congratulations again MIchelle. I'm so impressed and you look fabulous! Congrats on an awesome job!!!! I think the most important part is having fun and I'm so glad you did! I get a little emotional too at the end of some of my races. Usually when I do a new distance or something that I just didn't think I could I do. Wow! Congrats! That is a huge accomplishment!!!! Congratulations!! I "met" on the Active site (Newbies tri) and I have to say that I have really enjoyed reading back through your blogs. You are quite inspiring! I too have been on an amazing journey this year through weight loss and my first Triathlon so I can truly appreciate where you are coming from.